Very boring. No character at all to this one. It gave a story to a trivia in my mind, and unfortunately what Robinson has done was not trivial at all. I have a hard time to understand the extent of racism post-WWII in the USA. I mean there was discrimination and prejudice in where I grew too, but not letting people into restaurants, restrooms, complete segregation? I just cannot believe it. As a movie, it has a nice flow and very good acting and real Robinson provided enough dramatic sports moments to prevent the movie from being boring. 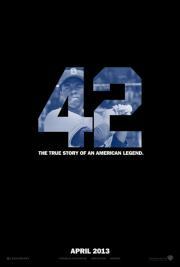 It was pretty good as a baseball film, but as a biopic, it didn't seem hard-hitting enough. Felt a little like some parts were sugar coated, which to be fair, probably made the film more watchable rather than have it be completely full of hate. The performances were all pretty good and the baseball scenes were all filmed quite well. There is the expected emotional climax, and you feel such respect for the man, but the film could have been better. I agree with the majority of the critics on this one. The highlights are Boseman and Ford's performances, and the fact that Robinson's story is one of true inspiration. The movie itself is handled pretty much like an Oscar-bait, made for TV movie, but it's still an important and decently executed film.